This year, for the second time, there were two winners of the award: Keith Turner and Margaret Nuth. Keith and Margaret were nominated for all of their hard work in putting together the Camertonia Archive, which entailed indexing every article appearing in every edition of Camertonia since 1949. A summary of every article and a searchable database is now accessible from the BACAS website. In addition, at the time of writing, PDFs are available for every article published in the 2009, 2010 and 2011 editions and Margaret and Keith currently working on scanning in all articles from all editions. The Archive went live in October 2012 and is already proving to be a valuable research resource. As Keith and Margaret have always been a fan of Sally Phillips’ wonderful cartoons, the Committee commissioned Sally to produce a cartoon for each of them, which were then framed, and, as usual, they were excellent. 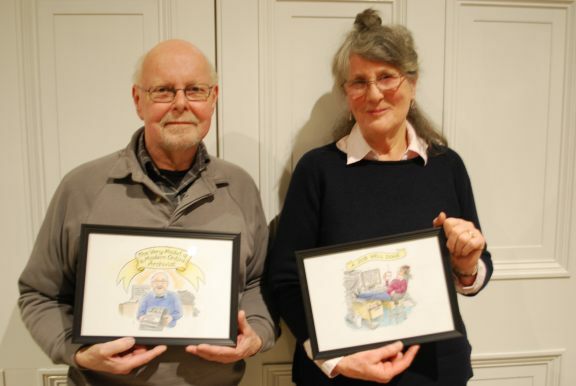 Congratulations to Keith and Margaret, who are pictured here with their cartoons. Clive was a very active member of BACAS and the Committee decided to grant, in his memory, an annual award to the nominated member who is considered to have made the most important contribution to the Society during the previous year.